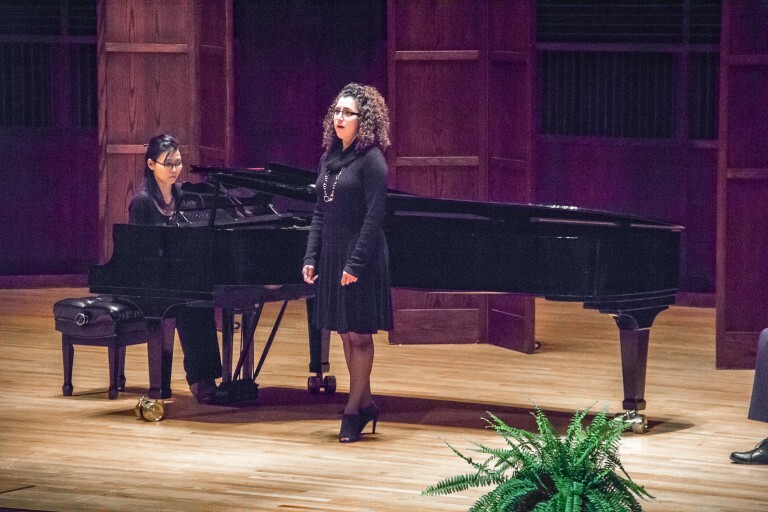 The University of Indianapolis presented “Evening of Song” on April 5 at 7:30 p.m. in the Ruth Lilly Performance Hall in the Christel DeHaan Fine Arts Center. Staff accompanist Haruka Ostajić accompanied the concert and Professor of Music Kathleen Hacker directed the performance. The performance included arrangements by African American Heritage and African American composers. The concert included 13 UIndy students who performed solo arrangements from composers Harold T. Burleigh, Robert Owens, Margaret Bonds, William Grant Still, Leslie Adams, Mark Fax and Moses Hogan. The next set of five performances were arrangements from multiple composers. Freshman vocal performance major Brenden Everett began the second set by performing “Heart,” composed by Robert Owen. Junior music technology, recording and communication major Sarah Smith followed with “Minstrel Man,” composed by Margaret Bonds. Sophomore music education major Tara Bradley performed “Grief,” by William Grant Still. Then sophomore music education major Ivy Bott sang “For You There Is No Song” composed by Leslie Adams. Senior performance major Shannon Christie completed the second set of performances with “Cassandra’s Lullaby,” by Mark Fax. Huffman, who performed in the first set, said she thought the concert went well. “I really enjoyed being a part of the performance,” Huffman said. “Everyone did great. I especially enjoyed the theme of the concert. Usually when you take a bunch of solo performers with no theme, it [the concert] doesn’t fit together. For our concert, we all had the same theme, so we all fit perfectly together,” Huffman said.